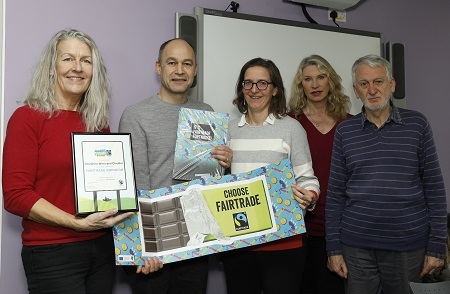 Cheshire West and Chester Council has successfully renewed Fairtrade borough status for two years, following its ongoing commitment to promoting Fairtrade principles. The borough’s Fairtrade Steering Group, which includes campaigners and supporters from Neston, Ellesmere Port and Chester, has revealed plans to promote Fairtrade to more community groups and businesses in the area by taking part in campaigns, including the UK-wide Fairtrade Fortnight at the end of February. Plans for Fairtrade Fortnight include a Fairtrade stall in Chester Market, Fairtrade Coffee Mornings and other activities across the borough. Chester became the first Fairtrade City in 2002 and later Cheshire West and Chester Council was awarded Fairtrade status in recognition of the strong support for Fairtrade within the borough, and the achievement of five qualifying goals, including a wide availability of Fairtrade products in local shops and catering outlets, high levels of support from local people, businesses, the Council, faith groups and schools. John Tacon, Acting Chair of the Fairtrade Steering Group said: “This is a major achievement for the borough. Fairtrade is about better prices, decent working conditions and fair terms of trade for farmers and workers in developing countries and helps them have more control over their futures and protect the environment in which they live and work. To get more involved with Fairtrade in west Cheshire , visit their Facebook page: cheshirewestfairtrade.